The Casey Station in Antarctica was undergoing substantial refurbishments to its Redshed. Large and awkward supplies needed to be moved from the loading bays into the building for installation and storage, and the waste and packaging would then need to be removed from the building once finished. The items needed to be moved to the first or the second floor, and the handling system would need to be able to be installed to existing building structure. And, uniquely to this environment, materials needed to be moved into or out of the building as quickly as possible to minimise the amount of time the interior of the building was exposed to the extreme weather. An Altrac jib arm was the perfect solution for this problem. The lightweight arm was easily transported to the site and the fitters there were able to fit it to an existing building post with no modifications required. 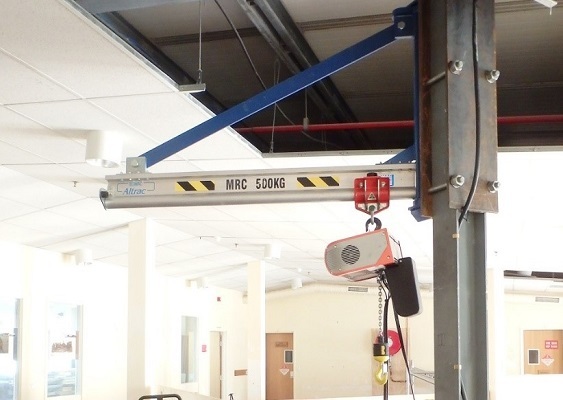 Fitted to the upper part of the post and paired with an electric chain hoist, the crane was able to lift items easily to the first or second floor as required. According to Nick Cartwright, Building Services Supervisor at the Casey Station, “It has served us well. It was of paramount importance to provide the appropriate access into the Casey Redshed for the quantity and size of our refurbishment materials. The jib was simple to install and easy to use, allowing items to be quickly placed where they were required and keeping the shed doors open for the shortest amount of time possible. It allowed an efficient workflow during the renovations. As an extra bonus, the arm will be repurposed to another site on the station now that the renovations are complete, an important trait when working in a location where you can’t just pop down to the shops when something is needed. Here at Bomac we think it is a pretty special sort of crane indeed that can “win some hearts” and we are thrilled that our customers love our cranes as much as we do.